« Anyone remember the Public Nuisance Fiat Altered? 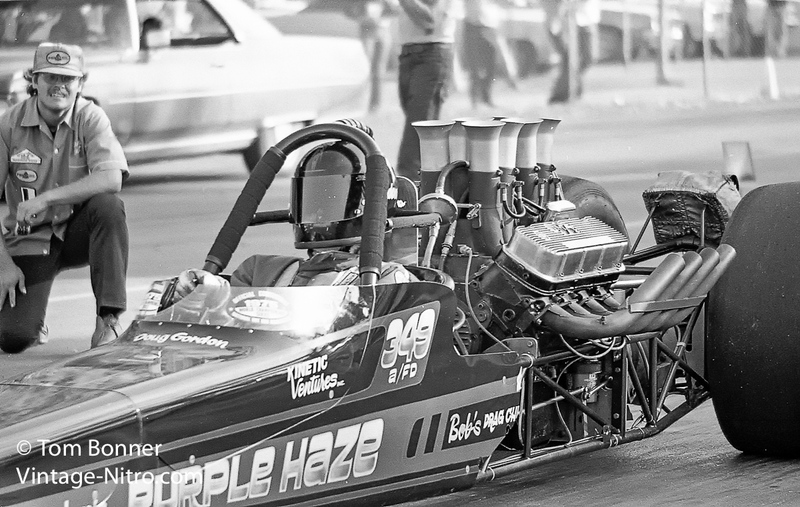 The Gordon and Best “Purple Haze” A/FD, seen at it’s last outing at Milan Dragway, October 1975. The last time around, I asked Vintage-Nitro readers for information on the Public Nuisance Fiat. A tip of the hat to Ron Thums, who identified the car as the former ride of Doug Gordon. Not only did Ron name the car’s owner, he also linked to a website in which Gordon recounts his drag racing experiences in the ’70s. That is Gordon in the Purple Haze A/FD dragster above, which I photographed winning a Pro Comp event at Milan Dragway in 1975. The dragster is a far cry from the humble Fiat I captured at Detroit Dragway. Until Thums posted his comment, I never knew that there was any connection between this car and that old-school Fiat. While most of Gordon’s Purple Haze website deals with the history of the Gordon and Best dragster, Gordon relates that “his first real race car” was the Fiat altered. There is a somewhat blurry photo of the Fiat racing at Lapeer Dragway, but there is no question it is the same car. Gordon answered some of the questions I pondered on in my last post. First the car was indeed a steel bodied Fiat, not a fiberglass reproduction. It was powered by an injected 427 Chevy. Unfortunately, it seems the car’s racing career ended when Gordon came down from a wheel stand a little too hard and broke the frame. That is when Gordon and Steve Best decided to team up on nitro-burning Pontiac (!) front engine dragster. Later the team upgraded to to the rear engined Chevy powered car seen above. Interestingly, my very first visit to Milan Dragway came when I covered the season-ending Pro Comp show in October, 1975. Gordon and Best won the event with the Purple Haze, which I reported on in Drag News. While this was my first time at Milan Dragway, it proved the last time ever for the Gordon and Best team. The car was sold immediately afterward and the team planned on building a new machine for 1976. That never materialized and Gordon and Best dissolved their partnership. According to Gordon’s website, he hasn’t returned to the dragstrip since 1976. So that is the story of the Public Nuisance. Or is it? From Gordon’s website, it appears he purchased the Public Nuisance, pretty much as a turn-key race car. Since it doesn’t say Doug Gordon on the door panels, I’m guessing when I spotted the car at Detroit Dragway it was being campaigned by the former owner. So we still don’t know who built the car or how it came to be. So the quest continues. Who built the Public Nuisance? When was it built? What happened to the former owner or owners? This entry was posted in 1975, Milan Dragway and tagged big block Chevy, Doug Gordon, Milan Dragway, Pro Comp, Top Fuel Dragster. Bookmark the permalink. Post a comment or leave a trackback: Trackback URL.